I’ve been sitting on boxes of fine art, museum quality heavy paper prints I made of Holly in the early 90’s. Back then, Holly and I had grand plans of selling these in our favorite cities after the hopeful making of A Low Life In High Heels Movie, her autobiography. We took them to the anniversary of the Warhol film Trash in NYC, sold some on eBay and planned on doing a tour after her documentary came out. The documentary to this day has not been released. She signed each one in pencil … just like the fine artists do as we were paying the greatest amount of respect to the photographer Jarry Lang. Jarry was my fabulous Uncle, Great Grand-Son of Charles VII of Spain, a well known celebrity photographer in NYC, and a dear friend of Andy Warhol’s from the early days. Looking back, it should have been a red sharpie! Everyone that popped over left with lipstick on as we covered some prints with lip smacks. Holly could make a straight man in a suit happy to put on bright red lipstick! I have not opened the boxes we saved for nearly 20 years. Holly kept telling me to save these for the release of her documentary, even in the last weeks of her life. With the current “Political Climate Changes” taking place, I can just hear her voice … Sell them now and help! The sale of these signed Holly prints will further fulfill Holly’s last wish, to help support the homeless in the LGBT community. The remainder of a Go Fund Me account that was created to care for her was donated to the LA LGBT Center. This project will support the LGBT homeless in NYC, where everything began for her. I want to make these as affordable as possible for everyone. These signed prints are available on Etsy for $129.00, insured with free shipping. Truly, there is no greater time in recent history to support the LGBT community. 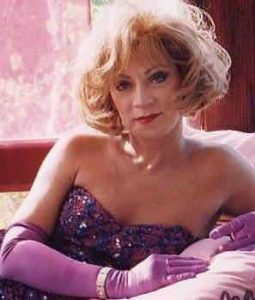 Together we can all do some good in memory of one of the first transgender trailblazers, Holly Woodlawn! Most importantly, the funds raised can help save lives. These prints will be available through January 15th unless sold out! 25% of the profit from each print order will go to The Ali Forney Center in NYC… the city she loved the most! The remaining profit will in part help support a museum and gallery exhibit currently being planned. This exhibit will feature amazing original photographs of Holly, Candy Darling and Jackie Curtis by Jarry Lang, Andy Warhol Original Art given to Jarry by Andy, and memorabilia. Some of these signed prints will be saved for the exhibits. These exhibits will further support this same effort. As Holly liked to say … HapPy “HOLLY” DaYs with her hand in the air!